How do I use DermaSwim? Stop smelling like the pool. Help protect your skin before you jump in! DermaSwim is the World's First Pre-Swimming Lotion! DermaSwim pre swimming lotion helps block chlorine which helps stop pool rash, chlorine itch, and chlorine rash. DermaSwim was designed by competitive swimmers who love to swim, but don't enjoy the drying effect that chlorine has on the skin. Swimming pool rash, chlorine rash, chlorine itch and dry skin are all a thing of the past with the chlorine protection of DermaSwim. Swimming is extremely good for you, but chlorine isn't. In fact, the next time you're in the pool, take notice of the condition of the lap lane dividers. The plastic donuts are probably eaten away from the chlorine. If chlorine can do that to plastic, what is it doing to your skin? While swimming in chlorinated water, your skin begins to feel gritty. The chlorine itch starts to set in right away. With DermaSwim anti chlorine lotion on, you actually feel smooth and slippery, which makes your swims more enjoyable. DermaSwim swim lotion is applied to your skin before you get in the pool. It forms a protective barrier which helps block chlorine and greatly reduces the chlorine itch, dry skin, pool rash, and chlorine rash caused by an otherwise fantastic swim. It also prevents your skin from smelling like chlorine after a swim. Using chlorine protection is far better than allowing your skin to be dried out by swimming and then trying to treat it with lotion afterwards. The makers of DermaSwim anti chlorine lotion believe that swimming is one of the best forms of exercise in life, and we also believe on taking care of the skin. 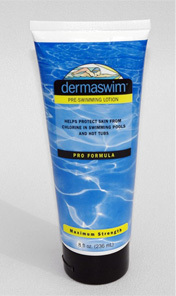 Use DermaSwim pre swimming lotion to help protect your skin from pool rash. As a positive side effect of using DermaSwim, you will enjoy your swimming so much that you will probably want to be in the pool even more!